Our proven 4 step customer attraction formula will help attract, convert and keep more customers. Confused about which path to take for success? Let us create a blueprint custom to your business. Attract more customers now, and business success will follow. We create Digital Marketing strategies that attract, convert and help you keep more customers. We can create and manage a marketing strategy campaign that will give your business maximum exposure and help attract more customers to buy your products or services. Our SEO (Search Engine Optimization) services will help your website show up on the first page of search engines like Google so customers can find you faster and easier. A good Social Media strategy will give more exposure for your company and help target customers to show them the products or services you offer, in an engaging way. Want to learn how to attract customers yourself? Our online courses will show you exactly how. Get access to our customer attraction video courses and business resources. There is more than one way to attract customers, and the answer is written within the pages of this marketing book. 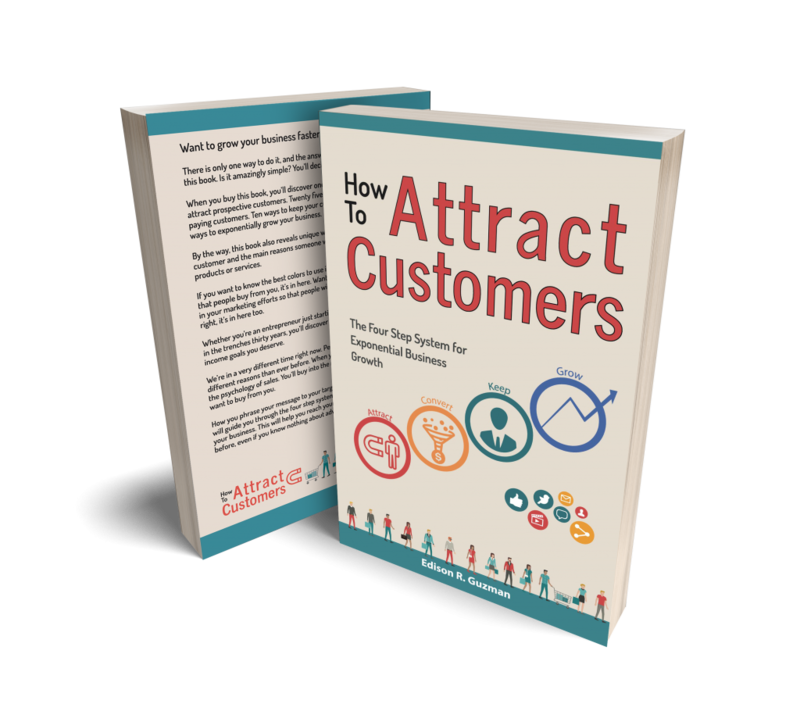 When you buy this book, you’ll discover one hundred and nineteen ways to attract prospective customers. Twenty five ways to convert them into paying customers. Ten ways to keep your customers happy, and nineteen ways to exponentially grow your business with your customers. By the way, this book also reveals unique ways to identify your perfect customer and the main reasons customers would consider buying your products or services. If you want to know the best colors to use in marketing and branding your business, so that customers buy from you, it’s in here. Want to know the best words to use in your marketing efforts so that customers will buy what you’re selling? That’s right, it’s in here too. Whether you’re an entrepreneur just starting out, or small business owner in the trenches thirty years, you’ll discover what it takes to reach the income goals you deserve. We’re in a very different time right now. People become customers for different reasons and in different ways than ever before. When you buy this book you’ll discover the psychology of sales. You’ll buy into the notion that customers genuinely want to buy from you. How you phrase your message to your target audience is the key. This book will guide you through the proven four step system that will show you how to attract customers and grow your business. This will help you reach your revenue goals faster than ever before, even if you know nothing about advertising or marketing.